BlackBox Wiring Boards provide maximum flexibility and room for future additions to any street rod or custom car. BlackBox wiring boards were cutting edge when they were introduced and now, 31 years and 14 major model updates later, they're still cutting edge. Peruse our selection of "full-size" wiring boards below. The All-New "WB-14 LED" is designed for LED turn signal-equipped vehicles running HEI, PCM, Pertronix II, or points ignition. The LED model includes our new LED flasher solution at a discounted price. These "No-Load" flashers fit under the ABS cover without any modifications or cutting of the cover. While retaining the same look and layout as the well-known WBx BlackBox, this 17-fuse / 26-circuit model is perfect for street rods and custom vehicles with newer technology engines, equipment, and ignition systems. This design features new, easy-to-wire power blocks, more circuits, and three on-board relays, labeled for Fuel Pump, Horn, and Fan. Kit includes easy wiring instructions tailored to your vehicle's equipment and terminal kit. LED-flashers, and easy wiring instructions tailored to your vehicle's equipment. While retaining the same look and layout as the well-known WBx BlackBox line, our all-new WB-14 model is designed for vehicles with HEI, PCM, Pertronix II, or points. This 17-fuse, 26-circuit model is perfect for street rods and custom vehicles with newer technology engines, equipment, and ignition systems. This design features new, easy-to-wire power blocks, more circuits, and three on-board relays, labeled for Fuel Pump, Horn, and Fan. Kit includes easy wiring instructions tailored to your vehicle's equipment and terminal kit. Thermal-flashers, and easy wiring instructions tailored to your vehicle's equipment. The compact WB-17 BlackBox Jr. has all the successful and popular BlackBox features; One-side wiring, inline terminals, fuses conveniently located right above their output terminals, and a clean, attractive final installation. Finally, an LED flasher that fits under the WB-9,10,11, 12 &14 BlackBox cover! Every LED flasher we've seen is either too tall or has an incompatible electrical "footprint". This one works perfectly on both counts. 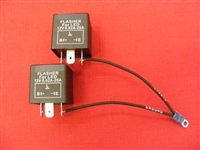 The upgrade kit includes two LED flasher units that flash at a constant rate regardless of electrical load. This kit will convert any Enos or Racers BlackBox wiring board to allow use of LED turn signals. 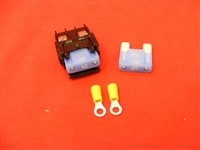 (If ordering a new wiring board, order the LED model and this flasher kit is included at discount pricing) Modern cars protect their main body wiring with fusible links, which are fine for them but blown fusible links are sometimes difficult to detect and repair. For custom vehicles, we recommend installing a 60 amp "Main Fuse" in the battery or starter pigtail that supplies power to the main-vehicle 10-gauge wiring. 10 -gauge wiring is good for about 60 amps and that Optima you have can produce about 1000 amps. If you have a short in the main wiring or ignition key switch, that Optima will turn your main wiring into a toaster (or fire) and it won't be pretty. With a main fuse installed, a problem that would cause a melt-down or fire instead becomes a $2 blown fuse . A main-fuse is a good plan and we install one in every car we wire. This hard to find fuse holder is our favorite because it's professional, it's easily installed, and it's discrete. In addition to its obvious use in preventing a melt-down, it also serves as a discrete anti-theft device (remove the fuse and she's a no-go) and as a winter disconnect device. The kit comes with a tab-mount fuse holder, two fuses, 10-gauge wire terminals, and instructions. Replace that lost or broken cover. Fits all BlackBox models from R-Zero through the latest WB-14. "Get 'em while they're hot!" After almost 30-years of continuous WB-9,10,11 production, parts to manufacture this model are no longer made. We designed the new and now proven WB-14 with modern components to upgrade the design while retaining the key elements of the WB-9,10,11 series.